Paperback, 7.75 x 9.75 in. / 96 pgs. By Christian Bàk. Artwork by Xu Bing, Charles McCaffery, David Scher. Photographs by Justine Kurland. Text by Jonathan Ames, David Batchelor, Laura Kurgan, Allen Weiss, Gregory Whitehead, Charles Bernstein. Cabinet is a quarterly magazine of art and culture that confounds expectations of what is typically meant by the words "art," "culture," and even sometimes "magazine." Like the 17th-century cabinet of curiosities to which its name alludes, Cabinet is as interested in the margins of culture as the center. 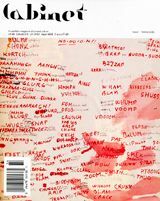 Featuring wide-ranging, multi-disciplinary content in each issue through the varied formats of regular columns, essays, interviews, and special artist projects, Cabinet's hybrid sensibility merges the popular appeal of an arts periodical with the visually engaging style of a design magazine and the in-depth exploration of a scholarly journal. Playful and serious, exuberant and committed, Cabinet's omnivorous appetite for understanding the world makes each of its issues a valuable sourcebook of ideas for a wide range of readers, from artists and designers to scientists and historians. Cabinet was founded on the proposition that an art magazine that genuinely tried to reflect the contemporary artist's relationship to the world might end up being utterly unrecognizable as an art magazine. 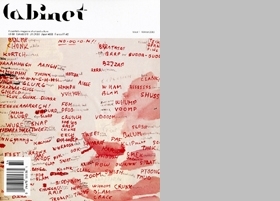 Cabinet is, paradoxically, an art magazine that almost never writes about art. Instead, the magazine invites its readers to participate in an ongoing investigation of the connections between superficially unrelated aspects of cultural expression. In an age of increasing specialization, Cabinet looks to previous models of the well-rounded thinker to forge a new type of magazine for the intellectually curious reader of the future. FORMAT: Paperback, 7.75 x 9.75 in. / 96 pgs.